While Napoleon took a dim view of the Duke of Wellington, his wife Marie Louise was more forgiving. Wellington met Marie Louise at the Congress of Vienna in 1815 and again at the Congress of Verona in 1822. 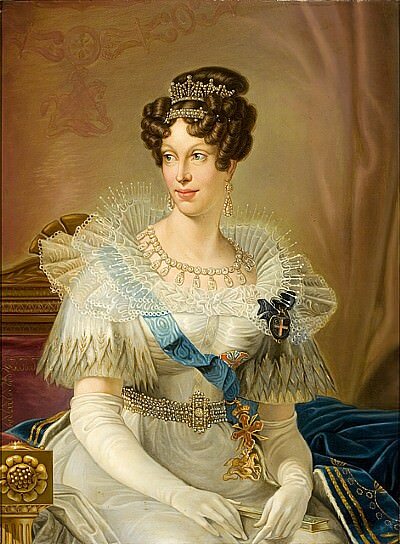 By this time, Marie Louise was the Duchess of Parma and married to Count von Neipperg (Napoleon had died in 1821). As Wellington tells Dorothea Lieven in Napoleon in America, he played cards with Marie Louise and paid in gold Napoléon coins. Marie Louise’s warmth towards Wellington at Verona inspired Lord Byron to write a poem. Wellington talked about his encounters with Napoleon’s wife in conversation with his friend Lord Mahon. Rambling from subject to subject, we came at length to the ex-Empress Maria Louisa. I mentioned Lord Strangford having told me that during the Congress of Verona he had often seen the Duke and the widow of Napoleon playing at écarté together, and the word “Napoleon” frequently passing between them in payments for the game. The Duke assented. He said that she had been very civil to him during the Congress, and that he had the honour of dining with her. She had the same cook that he had once – a man who had been formerly in Napoleon’s service – entered the Duke’s after Waterloo, but left it on the breaking up of his establishment, when the allied army was withdrawn from France – and then sought employment in Italy from his ancient mistress. On his report of the Duke’s usual fare, she accosted him thus the day the Duke dined with her: I am very sorry indeed that I could not get any roast mutton for you. Mahon is wrong on that last point. Although Marie Louise had three children with Neipperg before their marriage, the first was conceived in 1816, when Napoleon was safely imprisoned on St. Helena. According to the French representative at the 1822 Congress of Verona, Marie Louise was “in excellent spirits” there. 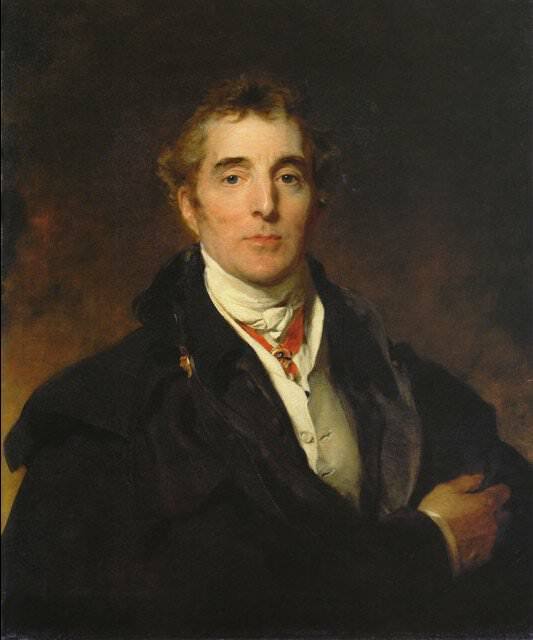 On November 18, 1822, Wellington was present at the opera in Verona when Marie Louise arrived. The first act was nearly over when the Arch Duchess Maria Louisa entered her box, attended by two Maids of Honour and her grand Chamberlain, Count Neipperg. When she first presented herself, she was wrapped up in a large kerseymere cloak trimmed with ermine, the night being rather cold, and on throwing it aside, she appeared dressed in a white satin slip, with a border of deep lace round the bosom. Her neck and bosom, which are very fine, were left quite exposed and she wore no ornaments. Her head dress consisted of a small white beaver hat, with a plume of ostrich feather to correspond, fastened at the side in a rosette of white ribbon. She looked extremely interesting and the more so from the eventful scenes with which her bloom of life has been associated. Lady Burghersh was Wellington’s niece, Priscilla Wellesley-Pole. She and Marie Louise had become friends in Italy (Priscilla’s husband was the British ambassador to Tuscany). Some found it unseemly for Marie Louise to appear on the arm of the man who had defeated her former husband. One writer tried to excuse her behaviour by blaming it on her father, Francis I of Austria. The averted eye of the reluctant muse. The theme of pity, and the wreck of power. A daughter? What did France’s widow there? Her only throne is in Napoleon’s grave. Must watch her through these paltry pageantries. To note the trappings of her mimic court. Nor Homer’s) Lo! on Pyrrhus’ arm she leans! Do more? or less? – and he in his new grave! And the Ex-empress grows as Ex a wife! So much for human ties in royal breasts! Earl Philip Henry Stanhope, Notes of Conversations with the Duke of Wellington, 1831-1851 (London, 1889), pp. 232-233. François-René de Chateaubriand, The Congress of Verona, Vol. 1 (London, 1838), p. 74. Galignani’s Messenger, No. 2419, Paris, December 3, 1822. Leigh Hunt, ed., The Literary Examiner (London, August 9, 1823), p. 94. George Gordon Byron, The Works of Lord Byron; In Verse and Prose (New York, 1835), p. 452. Here is an interesting thought – “Some found it unseemly for Marie Louise to appear on the arm of the man who had defeated her former husband.” Yet Napoleon had been unpopular in most countries. Marie Louise, still a young woman, would never have been able to talk to ANY man, if she eliminated all of Napoleon’s old enemies from her company. Good point, Hels. Though I think the Duke of Wellington raised particular objections among Napoleon’s supporters. Byron was a bit over the top. Since she couldn’t go with Bonaparte, Marie Louise had to find some means of carrying on in a post-Waterloo Europe. I don’t think it ever occurred to Marie Louise that it might be inappropriate to be seen cozying up to the Duke of Wellington. She saw him as her father’s ally rather than her late husband’s enemy. They were difficult times for lots of people as alliances changed. Well written and researched. Too bad modern politics isn’t played out in poetry! Thanks, Charles. I can just imagine a Byronic take on current events. This is indeed a brilliant research work embarked upon by so brilliant and intellectual a mind. I did enjoy reading every bit of it, especially the poem, with its remarkable artistry and fine delicacy of language. Thanks, Joseph. Glad you enjoyed it. Always nice to read a bit about the Duke. What a romantic episode !! It is interesting to learn that Byron didn’t like it. Why? Of course I will/should read Lord Byron’s poem (I wonder if I have it). Thanks, Shannon. I’m glad you liked the article, Constantine. Byron thought Marie Louise was betraying Napoleon’s memory by taking of the arm of the man responsible for the loss of his throne. He thought it would have been more fitting for her to act as if she were clearly in mourning for her late husband, rather than consorting with his former enemy. What must she have felt while thus taking the arm that had hurled both her husband and herself from the greatest Throne in the universe.